Naina Lal Kidwai often dials in on conference calls to discuss important corporate matters. The calls are related to her responsibilities not just as the country head of HSBC India but, at times, also as a non-executive director on the board of Swiss food giant Nestle SA. Occasionally, the calls come at a short notice, she says, recalling a time when Nestle was making an acquisition in China and another when it was about to sell a stake in a subsidiary. But no matter how urgently the meeting is convened, the board always gets "well-prepared" documents and "brilliant presentations" on topics under discussion, says Kidwai, the first Indian representative on Nestle's board. "It amazes me how every board member gets on a call instantly... and how they finish on time despite the huge numbers of issues that are discussed," she says. Kidwai is among a handful of Indian women professionals who are heralding a new trend among Indian corporate executives - joining the global boards of multinational companies (MNCs). A Harvard Business School alumna, she often gets requests to join MNC boards. But as per HSBC rules, she cannot take up more than one board position outside the banking group. "I think there is interest [among MNCs] for Indian professionals," she says. "It's not a big number, [but] it is a growing phenomenon." 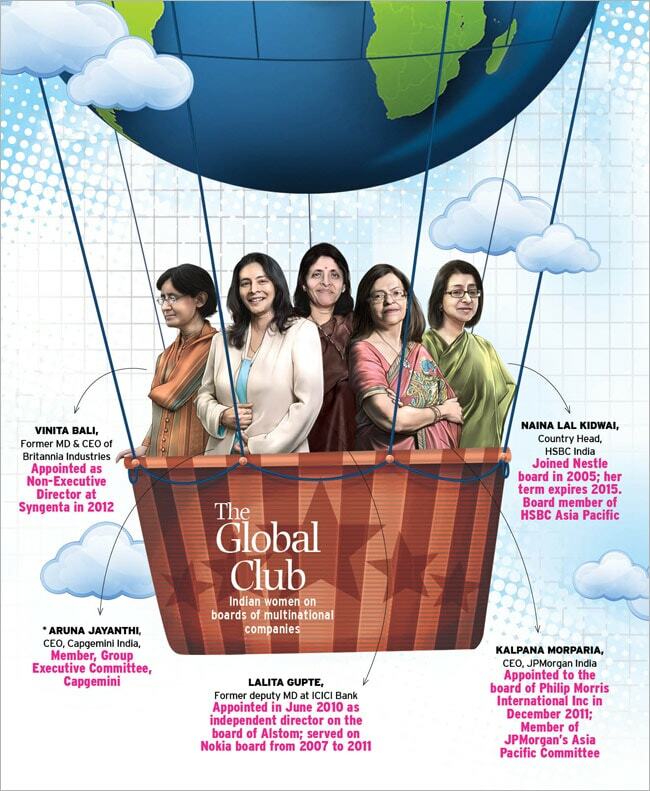 Besides Kidwai, several other Indian women have joined global boards in recent years. Vinita Bali, former managing director and CEO of biscuits maker Britannia Industries, joined the board of Swiss agribusiness giant Syngenta as a non-executive director in 2012. Kalpana Morparia, CEO of JPMorgan India, sits on the board of US tobacco company Philip Morris Inc. Lalita Gupte, a former joint MD at ICICI Bank, recently completed her term on the board of Finnish handset maker Nokia and has got a four-year extension on the board of French engineering giant Alstom. The number of Indian women on global boards might seem small but there are not many Indian men either in similar positions. Among the few Indian men who have been on global boards are Infosys Founder N.R. Narayana Murthy, Bharti Airtel's Sunil Bharti Mittal and Tata Group's Chairman-Emeritus Ratan Tata. Murthy was on the board of HSBC Holdings Plc while Mittal was with Standard Chartered and Unilever Plc. Tata sits on the board of Alcoa and Vindi Banga, a Unilever veteran who earlier headed the company's India operations, is on the board of British retailer Marks & Spencer. Why are MNCs appointing Indians on their boards? "Most Fortune 500 companies want diversity on their board, particularly if they have international businesses," explains Morparia. For Morparia, who was previously joint MD at ICICI Bank, diversity is not just about gender. "It's also about nationality, ethnicity, academic background, professional expertise, etc," she says. Kidwai, who had replaced then chairman of Sony Group Nobuyuki Idei on Nestle's board in November 2005, says western MNCs want more Asian representation on their boards. This is particularly true of companies such as Nestle that consider India an important market. When Morparia was inducted into the board of Phillip Morris, the US company's Chairman and CEO Louis Camilleri had said that her "keen perspective on Asia, which is a growth engine for the company, will represent an invaluable asset". Many of these women are playing an important role in the MNCs' global strategy. Morparia, who is part of JPMorgan's five-member Asia Pacific management committee of select CEOs from 14 countries, recently submitted an India 2020 plan to the panel. Kidwai is part of Nestle's audit committee and also sits on the board of HSBC Asia Pacific while Aruna Jayanthi, CEO of Capgemini India, is the only woman in the French IT company's 18-member Group Executive Committee. Unlike Indian companies, which often appoint friends and acquaintances of founders as directors, MNCs typically go to an executive search firm with defined parameters of the kind of professionals they look for to fill a board position. "Global firms follow a very professional approach by expanding the search and clearly defining the expertise they want to have on the board," says Morparia. E. Balaji, President-HR at TVS Logistics, says Indian women on global boards have experience of working in large corporations. "Any board would like to have their services," says Balaji, who earlier headed HR consulting firm Ma Foi Randstad. Gupte, who played a key role in building ICICI Bank's international presence, says MNCs often consider those people for directors' positions who have overseas exposure. Some socio-cultural traits also tip the scale in the favour of Indians when MNCs start building a diverse board. Indians, for instance, are comfortable with the English language and are exposed to western thinking and methods of doing business. "We mix easily. We fit readily on the board and, by nature, Indians are more gregarious," says Kidwai. The global exposure is not just giving a boost to these women's careers but is also benefiting India Inc, as these women sit on the boards of many local companies as well. Many of them say MNCs follow better corporate governance practices compared to most Indian companies, and the experience of working on such boards comes in handy for them in the Indian context. Morparia says many MNCs go back 100 years, and so corporate processes and governance standards evolved over a long period. "They are more process driven and the approach is far more mature," she says. Gupte and Kidwai, however, feel boards of many large companies in India follow global best practices. "I don't see any big difference in terms of strategy discussions, key points, (and) emphasis on risk analysis," says Gupte. Some industry executives say that Indian boards get heavily involved in routine activities and lose sight of long-term objectives. "The board is not management. The board's job is oversight," says a woman director who does not wish to be named. That is a critical lesson women directors, and even men, will do good to keep in mind. *An earlier version of this graphic gave an incorrect designation for Aruna Jayanthi. *An earlier version of this story erroneously mentioned Aruna Jayanthi's designation as CEO and MD of Capgemini India.